11 women had the honour of being chosen by Allah to be joined in matrimony to our beloved Prophet (peace and blessings be upon him) – marriages that were indeed decreed in the heavens and celebrated upon the earth. 11 women who earned such a high status with Allah and His Messenger (sallallahu alaihi wa sallam) that, though they have departed from this world, Muslims the world over send prayers upon their purified souls at the mention of their name. 11 women who sacrificed all that they had for the sake of their Lord thus securing the love of the final Messenger (sallallahu alaihi wa sallam) and leaving their mark upon the hearts of the Muslims until the day of judgement. • The Quran and Sunnah consistently remind the believers of the importance of gaining Islamic knowledge and implementing it in our lives. This is your opportunity to act upon this reminder and take away valuable new insights about the deen of Islam for the pleasure of Allah, most high. • The wives of the Prophet (sallallahu alaihi wa sallam) have more right over us in terms of love, protection and appreciation than our own family, making it incumbent upon us to educate ourselves on the qualities that made these women so honoured in the sight of Allah azzawajjal. • Individuals who cannot devote their time for full-time Islamic studies, thus seeking alternative, quality, Islamic courses. • Individuals wishing to increase their understanding and revive the Islamic spirit through understanding and implementation of the Sunnah. • Muslims who have a deep desire to learn about the details of the lives of the mothers of the believers to increase their sense of closeness to the family of the Prophet (sallallahu alaihi wa sallam) through the study of their qualities. 40 hadiths on the memorable qualities of the mothers of the believers. • An inspirational and spiritual uplift for your imaan as well as an increase in love and appreciation for these great women who hold a special status in the hearts of the believers. 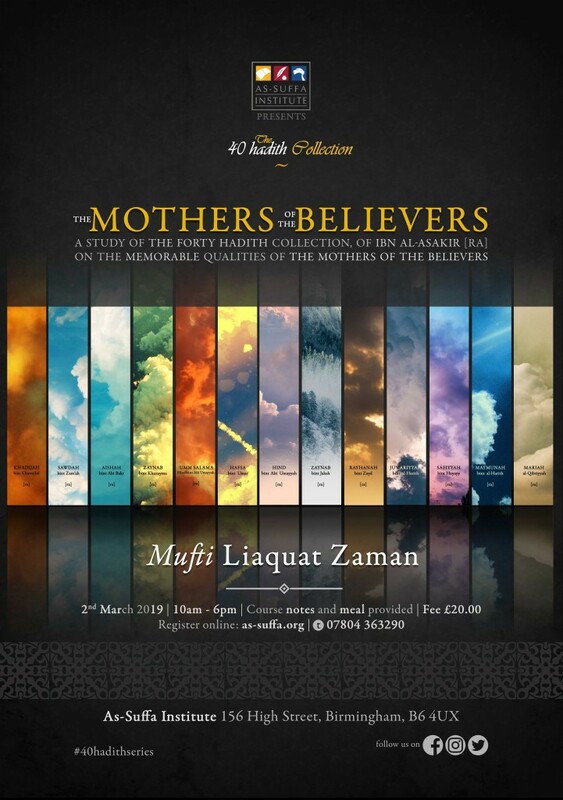 • A unique insight into the qualities and characteristics of the mothers of the believers, drawing upon incidents from their lives pre and post-marriage to the Prophet (sallallahu alaihi wa sallam) providing us with relevant examples of modesty, generosity and piety. • Answers to some of the most pertinent questions regarding circumstances surrounding the Prophet’s marriage to these women. • A course folder containing clearly structured notes that can be used as a source of reference in the future.